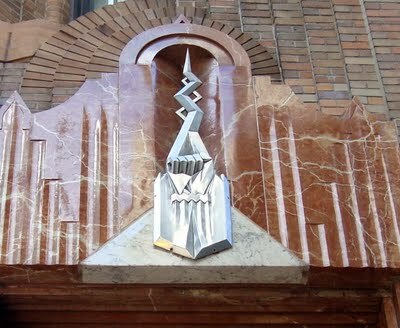 Last week I posted a few photos of the crown of the RCA Victor building on 51st and Lexington. The top of that building is one of my favorite art deco flourishes in all of Manhattan and it is little noticed by passers by. In the comments section, Pueblo Girl suggested I post a few pics of the interior. So here they be. All are clickable. 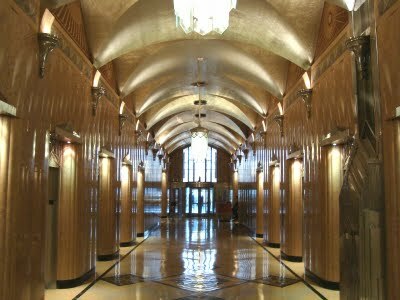 The building went up in 1931 and contains a wealth of art deco accents. Here’s the exterior at the corner of 51st. 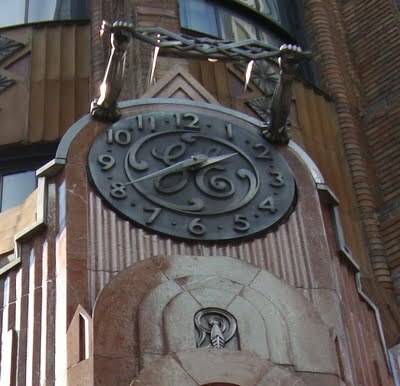 It was deeded to GE before construction was complete and this beautiful clock was installed. It features two outstretched arms holding radio waves. Also along the exterior are a series of fists clenching radio waves. Here’s a few interior shots. 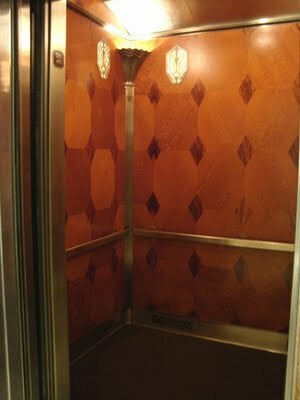 The elevators all have inlaid wood. Here’s one end of the lobby. Again, with the radio waves. Nice clock. And here’s the other end. This is probably the most elaborate mail box in history. 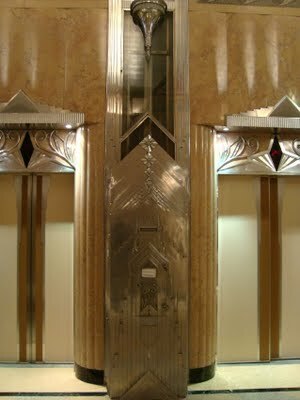 In the spring, I did a post featuring interior shots of the Chrysler Building—another lovely art deco building. They are here. This entry was posted in Art, NYC: A Users Guide, Uncategorized and tagged architecture, art deco, RCA Victor building by Exile on Pain Street. Bookmark the permalink. They just don’t have craftsmanship like that anymore. Has no one any pride left? That is such a beautiful building! I remember going into a building like that the first time I went to New York (before high school) and although I remember thinking the inside was pretty cool, I don’t remember which building it was nor did I really have the mental acuity (sp?) to really appreciate it at the time. Dammit that’s a gorgeous building. Oh, gorgeous! Thanks so much. Fantastic that it’s been preserved so well – what a jewel. TH: That’s true but I believe in 50 years time they’ll still be singing the same song and call this a “golden” age. E: That’s the hazard of traveling so young. You don’t know enough to appreciate it. Today would be a more appropriate time for you to see these works of art.Sid: Plenty where that came from. Believe me.Nurse: Lucky that you got a taste of this for a while, anyway.PG: You’re welcome! 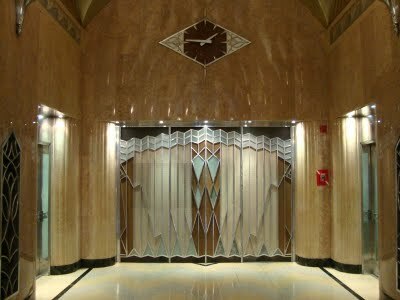 Don’t forget to click the link to the Chrysler Building interior. More of the same. 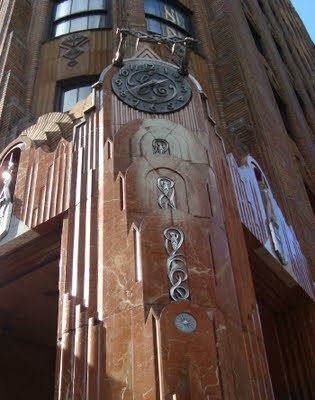 Beautiful photos of a beautiful building – love all those art deco details! I saw your Chrysler bldg. photos some time ago and love those too.Ahh, you’re a lucky man. I know. I’m a broken record.Thanks for the glimpses. Great post UB, keep them coming pal. I could look at architecture like this all day long. Wow! They don’t make them like that anymore. Have you ever noticed the top of the Bryant Park hotel?